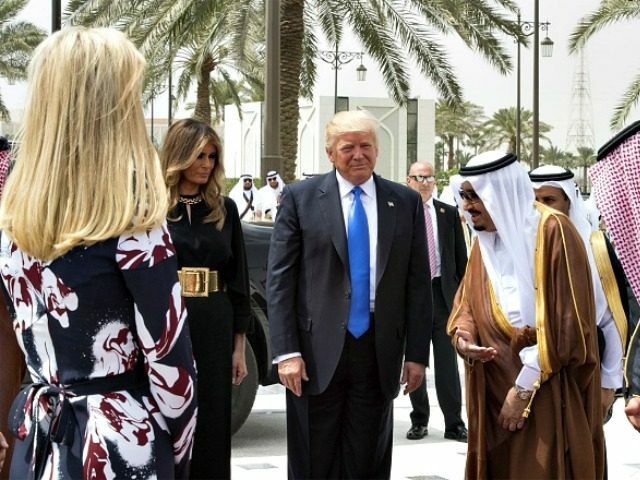 First lady Melania Trump and first daughter Ivanka Trump made headlines when they arrived Saturday morning in Riyadh, Saudi Arabia sans headscarves. The first lady wore a long black, flowing jumpsuit with a gold collar, along with a matching gold belt, with her long, brown hair uncovered. The first daughter wore a long dress with a navy-blue and purple pattern, and her blonde hair also was uncovered. The decision followed the recent tradition of visiting western dignitaries. There was media buzz over whether they would wear headscarves, due to a tweet by the president two years ago that was critical of then-first lady Michelle Obama’s decision to forego the headscarf. When asked why neither wore a headscarf, the White House responded they were not required to wear them, according to CNN. It is the president’s first foreign trip while in office, and he and his delegation are being closely scrutinized for any missteps. The Trumps were greeted by a lavish red-carpet welcome ceremony, and received by King Salman himself and other top Saudi officials. A military brass band played, and a fighter jet flew overhead, highlighting the importance of the visit. Shortly after his arrival, Salman presented Trump with a gilded necklace and medal, the country’s highest honor.